Different cities across the world offer tons of activities fit for every type of traveler. We think vacation time should be spent enjoying days full of whatever it is you love doing most, whether that be relaxing on the beach, savoring the best local food spots, or taking in the area’s local culture. In Pismo Beach, there are endless option to satisfy any and all of your vacation dreams, from fresh seafood, to oceanfront yoga, and even skydiving. Next time you’re stopping by “Classic California,” learn how to experience this one city, three different ways! Experiencing the culinary side of Pismo Beach is nothing short of extraordinary. There is definitely a plate to please every palate here, with tons of options ranging from contemporary, classic, and everything in between. A special attribute to the many dining spots here is the coastal influence and mass amounts of oceanfront or ocean view options. Restaurants like Ventana Grill and the Oyster Loft provide diners with an unbeatable view and some of the freshest seafood on the Central Coast. 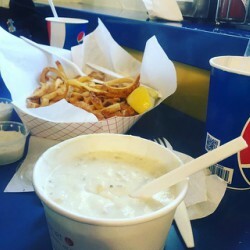 The deliciousness doesn’t stop there though, since Pismo is also home to famous spots like Splash Cafe for their amazing clam chowder and Old West Cinnamon Rolls for their ooey, gooey breakfast treats. 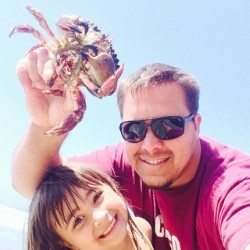 From Hoagie’s, to the Cracked Crab, and F. McLintock’s Saloon & Dining House, Pismo Beach is truly a food-lover’s paradise. There’s something to be said for waking up to the sound of the Pacific crashing on the ocean bluffs, the sun spilling into your ocean view suite, and the crisp, coastal air floating inside. If you’re the type of traveler who can’t get enough of the outdoors, Pismo Beach has just about every beach activity you can think of. From kayaking and stand-up paddle boarding, to relaxing on the warm sand, and even surf lessons from local pros, the outdoor traveler will find Pismo Beach feels like home. Even thrill-seekers will meed their match here, with Pismo Skydive providing the most exciting beach day you could ever imagine! The city of Pismo Beach has been inhabited for thousands of years, first with the Chumash Native Americans. Now in 2016, Pismo Beach is known to those near and far as “Classic California,” a quaint beach town perfect to visit and enjoy the beautiful Central Coast of California. 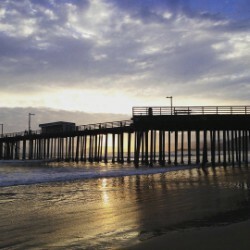 There are tons of spots in Pismo providing a deeper look into its rich history, such as the historic Pismo Beach Pier. The cultural elements home to Pismo, like fun live music at gorgeous oceanfront spots or even art galleries full of picturesque paintings of the beautiful surroundings, are a great way to experience the city like a local. The Monarch Butterfly Grove is a great place for learning more about the areas wildlife, something residents hold near and dear to their hearts.